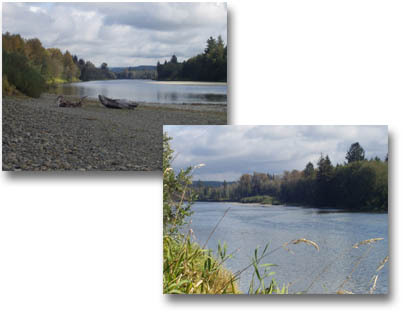 Quillayute River County Park has thirteen acres and 700 lineal feet of river frontage. Cast your line from the Richwine Gravel Bar, the premium place to fish on the river. Steelhead, salmon and other trout will be at your mercy. If fishing isn't your thing, enjoyment of the river environment can be found floating the river on a raft or kayak. Read a book in the quiet, shaded picnic area. A few miles downstream, the river empties into the Pacific Ocean at Lapush and Rialto Beach, of the Olympic National Park. The park entrance is located off Mora Road, about one mile east of the National Park entrance to Mora Campground. For more information, call the Clallam County Parks, Fair and Facilities Department 360-417-2291.